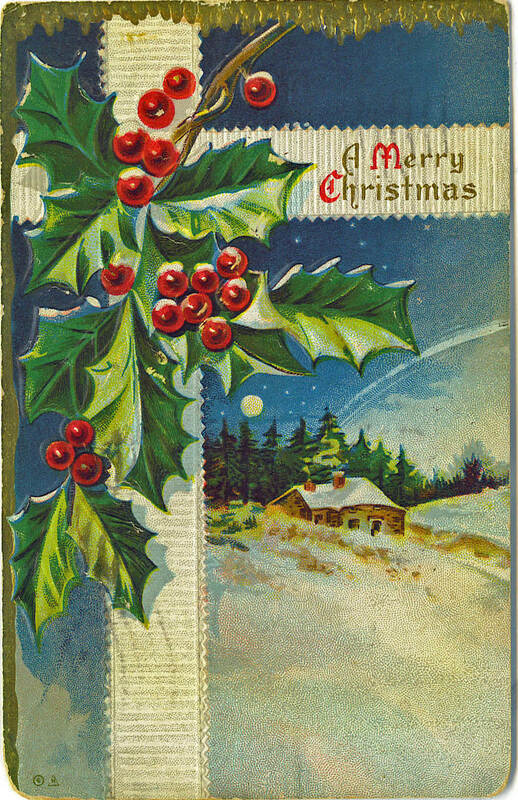 While going through a box of postage stamps from my great-uncle, I found a few lovely Christmas postcards. This one in particular caught my eye. On the back of the card is a one cent stamp postmarked Dec 23 9 AM 1911, New Bedford, Mass. This card is almost 98 years old and still looks great. What you don’t really see in the photo is that the card is embossed, the white ribbon and the holly leaves as well as the gold trim at the top and left side. Very pretty. I am going to add it to my Christmas Journal by placing it in a pocket that will protect it but so that you can still see the beauty. Please feel free to download this image to use in your Christmas Art projects. You can right-click on the image to copy it. Merry Christmas to all of my art friends near and far. THis is gorgeous! thanks!!! I found your blog from Mary Ann’s class. I’m trying to catch up! Oh Donna – I would love that. Perhaps a sampler we could send back and forth? Left a note on your blog as well. Merry Christmas and many blessings for the New Year! !